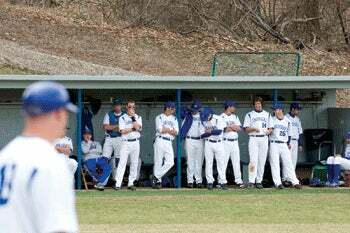 In a tradition as old as baseball itself, an editor who criticized the Hillsdale College (Mich.) baseball team's putrid record found his front porch decorated with dead animal carcasses, including a shotgunned goat. In the recent past Hillsdale managed to can its women's cheer team, the soccer team, men's swimming and men's golf. God knows what they did wrong. Even more disturbing, the rugby team (4-3) struggles to become a recognized club (despite field success) as the dean of men pushes to bring a Nerf-war club into fruition. What? Most of you walk around campus with this chip-on-my-shoulder, badass tempo. How is this possible? It's not enough for you to simply lumber around like the other disappointing athletes? Lose the stride boys. Hillsdale senior John Krudy, an editor at the paper, lives at the address festooned with the dead animals. A witness across the street, Nathan McClallen, said he saw "figures" placing the animals on the porch with a shovel. Seems like a rational response to an editorial. I would tell you more but no one over there is returning calls. What little I know about their baseball team is this: It's coached by Paul Noce, who attended the same high school as I did (Sequoia in Redwood City, Calif.), and played briefly for the Cubs and Reds. As for Hillsdale, it produced one of the great all-time directors, Bob Clark (Porky's, A Christmas Story). This past week's staff editorial about the baseball team was a mistake, and we can't stand by that expressed opinion. Maybe the right sentiment was there in the beginning, but what we published was poorly written, reported and edited. We now realize there are conditions the baseball team faces, for example a financial disadvantage other teams may not worry about. We kicked a guy when he was down; published an opinion rooted in gossip rather than reported fact. Especially, we never should have attacked the character of the baseball team or the coaching staff. We understand you do your best to represent the college well. You are supported by the editorial board as one of our Charger teams and we hope you snag a win this weekend.